CS GO Danger Zone is the new competitive game mode that brings Counterstrike on to a new level! Find 8 Battle Royale tips here to rule the CS GO servers. What is Counterstrike CS GO Danger Zone? The new Counterstrike mode called Danger Zone is a typical Battle Royale mode like seen in Fortnite, PUBG or the Hunger Games Movies. A number of players are thrown into a battle field and the last man standing will win the game. You have to search loot to equip yourself with great weapons, while the danger zone is getting tighter and tigther which brings all players to one final spot in the end. How much CS GO Danger zone costs? Normally everyone had to pay $14.99 in Steam to buy Counterstrike Global Offensive, but it is absolutely free to play. With the new Battle Royale mode the game got free to play and will possibly attract new players. All players who already paid for the game, will have advantages like the Prime status, Prime-exlusive item drops and Prime machtmaking. They will get the commemorative Loyality Badge. Players can still upgrade their account to Prime for the same price as before. How many players can play in Counterstrike Danger Zone? 16 Players are matched against each others on the map Blacksite. Which teams are allowed in Danger Zone? In Counsterstrike CS GO Danger Zone you can pay solo, as a duo or trio team, each mode has its own tactics and behaviour. What can you do in CS GO Danger Zone? The main target is of course to eliminate all enemies. Take on lucrative contracts to take down targets. Rescue hostages for some extra cash. Blow up safes to find money. Using the Danger Zone tablet which shows the safe and unsafe spots. CS GO Danger Zone Tips – How to win Counterstrike Battle Royale Maps? Let’s start with the game tips for Danger Zone, try to play calm and to follow these rules to achieve the victory. Playing Danger Zone is a bit different compared to normal Counterstrike maps: The map is really really big and you have to be careful, enemies can shot you down from spots you will not even see. You can make use of the developer console to explore the map Blacksite. With the landing zone you choose, you also choose a tactical decision. Land in the crowded spots, where often a lot of loot is waiting and rush fast into the fight if you feel strong in early battles. But you can also easily dodge these areas and move forward slowly to equip and prepare yourself before you fight. If you just started Danger Zone you will see how fast you can die, choose which option is better for you but it is important to get to know the map Blacksite perfectly to be aware of anything that can happen! In some game parts it is smart to wait for some opponents who rush into a skirmish and take down each other. While waiting you can bring down Danger Zone drones. On the one hand it is extremely loud to this and your opponents will be able to identify your position, but you can get awesome supplies with a bit luck. In the game part after 2-3 minutes the map is still big and you got a good chance to bring down a drone safely. You can throw the tablet on the ground before getting the loot, so that the enemies will not see your position. As the ammo in Danger Zone is quite limited, it is a ressource that you should take care of. Everytime you got a weapon check the ammo and before taking a fight you always have to know how much ammo is left! If you find new weapons it is smarter to use that one that has more ammo. Each weapon is strong at something, always change your tactical behaviour according to a weapon. With an AK-47 or M4 you don’t have to fight close 1on1s, better use the range. With SMGs a closer ranged can win you the fight. Move around safe, use the natural cover, buildings trees and tall grass. (Be careful tall grass can be burned down by fire bombs.) Don’t run around all the time, always reach a new safe spot and wait a bit, check all directions and get a good overview about what is happening on the map and near you. 7. Be careful with the red explosive barrels! Be careful with the red barrels, if you are in a fight never move to the red barrels! Bullets that hit the red barrels cann lead to a huge explosion with a large area of effect. Use the red barrels for your advantage and hit them if enemies are near! If a hexagon on the in-game tablet is yellow, it means an enemy is inside of that zone. Your hexagon, the one you are in, is of course always yellow. This can get really useful if you are in the mid game, check the tablet regularly to get the perfect overview. 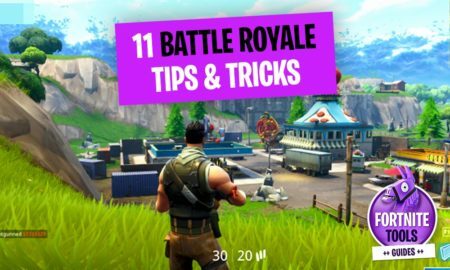 If you have more helpful tips add them in the comment section!